The Florida State Fair returns to Tampa tomorrow up, and that means Florida State Fair food is back! And this year it's as outrageous as ever, bringing along some really crazy(awesome!) concoctions. Because why else do we really go to the fair? Tickets for entry Monday thru Thursday are $11 and $13 for Friday, Saturday, Sunday and Presidents' Day. This allows you into the expo hall, petting zoos, Cracker Country and much more. For rides you must purchase tickets, but food is available on your card or with cash. And food at the Florida State Fair provides plenty of choices to guarantee that everyone will find something! It's the third year that The Midway Eye is coming to the Florida State Fair. It is the largest traveling Ferris Wheel in the United States, and will be competing with the fried foods for the longest line. It stands 155-feet above the fair, giving riders a birds-eye view of other attendees eating giant turkey legs and playing Midway games until their wallets are empty. But the best part of being 155 feet above the fair is the aroma of brisket being smoked, turkey legs being grilled, and pizza cone’s being filled with onions and peppers. Above all, you smell the oil that is frying just about anything: Oreos, pickles, butter, etc. Because who goes to the fair not to gain a few pounds eating delicious and outrageous feats of culinary excess? The popular Carousel Foods is guaranteed to bring another hit to the Florida State Fair. This intriguing burger will be filled with cherries, basil, shallots, garlic and a cherry orange relish to top it off. This will all be in-between a brioche bun. This color-filled grilled cheese will be standing out and completely picture worthy. The grilled cheese will have Gouda, mozzarella, and provolone melted inside. This Cuban themed slice will have a Dijonnaise base for the "sauce" and will be topped with a blend of mozzarella and Swiss cheese, roast pork, ham and pickles. The batter of this unique funnel cake will have spices, red beans, and rice mixed into it. After this, it will be topped with smoked sausage, onions, peppers and beans. This will be sure to add to the yearly, unique new funnel cakes. This giant mozzarella stick will over 1/4 of a pound and filled with mozzarella cheese. Coconut Cream Doughnut - Peachey's Baking Co. Known for their famously delicious doughnuts and pretzels, you will have to make a stop at Peachey's Baking Co. Give their new doughnut a try in order to have a complete visit at the Florida State Fair. Who thought there wasn't room to make cookie dough even yummier? Various flavors of these fried cookie dough balls will be offered and include chocolate chip, peanut butter, and birthday cake. 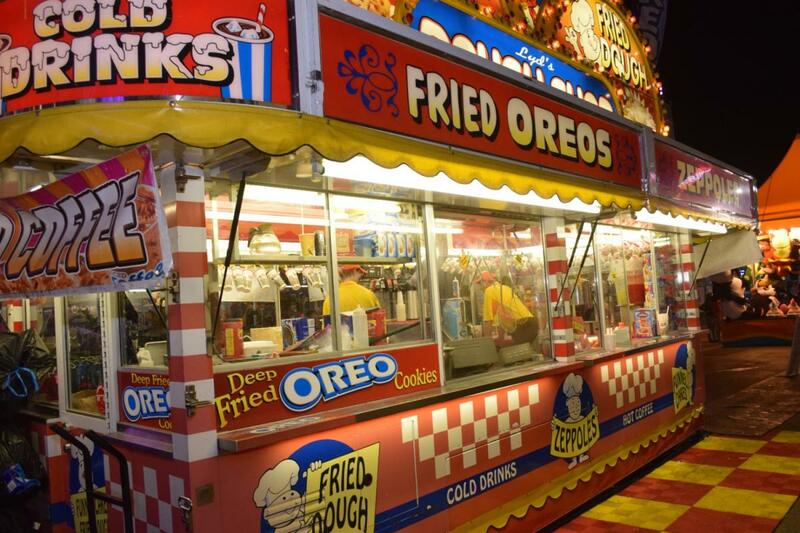 So forget about the diet for a day, and enjoy the Florida State Fair food from February 6th-18th. But don't forget the games and rides since you'll need to burn some of those calories! For more information on things to Do for the whole family in Tampa, check us out on 813area. We're your free guide to everything local!